Hospital ancillary services are those supplemental or auxiliary services that are provided to patients in order to support the diagnosis and treatment of conditions. Ancillary services can be divided into three categories-diagnostic, custodial, and therapeutic. Ancillary services refer to health care services provided exclusive of room and board. Ancillary departments form the backbone in the functioning of a tertiary care hospital without which doctors, dentists, and nurses would not be able to function effectively. Any person working in an occupation is exposed to occupational health hazards-be it physical, chemical, or biological. Occupational health and safety as defined by the World Health Organization and International Labour Organization is "the promotion and maintenance of the highest degree of physical, mental and social well-being of workers in all occupations and prevention amongst workers of departures from health caused by their working." Not only the occupational safety but also the general health and welfare of these workers should be a priority. These workers are often neglected; their health takes a backseat and in turn, affects their work capacity and productivity. This study was conducted with the objective of assessing the morbidity profile of the staff working in ancillary departments at a tertiary care hospital. We conducted our study in a 1,200-bedded tertiary care hospital with an outpatient turnover of 2,000 patients/day, located in Bengaluru Urban district in Karnataka, India. The ancillary departments taken as part of this study are the following: Dietary, laundry and linen, central sterile supply department, and waste management. Annual medical checkups (AMCs) for employees in these departments had been introduced recently. AMC is a mandate; it is done free of cost and during the working hours. Regular follow-up for chronic morbidities. On obtaining the management's and departmental head's permissions and consent (both verbal and written) from the employee, AMC was conducted for 150 employees in the year 2013. Data from the annual medical records were entered in Microsoft Excel and analyzed using IBM Statistical Package for Social Sciences (SPSS) version 21.0. Frequencies, proportions, and means were calculated; Pearson's Chi-square test and Spearman's rank correlation were performed to look for associations. Of the 150 employees examined, the majority was male (72%). Mean age of the workers was 37.96 ± 10.9 years. Tenure of work ranged from a minimum of 6 months to a maximum of 39 years with a mean of 12.92 ± 10.62 years. The dietary department constituted the largest workforce (44%) followed by the laundry and linen department (30%) [Table 1]. The most common morbidities were diabetes mellitus (11%), hypertension (10.6%), musculoskeletal disorder (9.3%), surgical problems (8.6%), and dental caries (6.6%). Among workers in the dietary department, an important morbidity such as worm infestation was detected, which has a direct bearing on the work being done and the health of those who consume food cooked by these staff. Three employees in the laundry and linen department reported having occupational injuries. 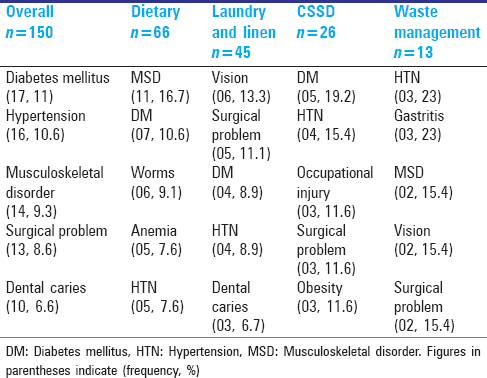 Visual problems were seen to be an important morbidity in both the laundry and waste management departments [Table 2]. Of the 150 employees. 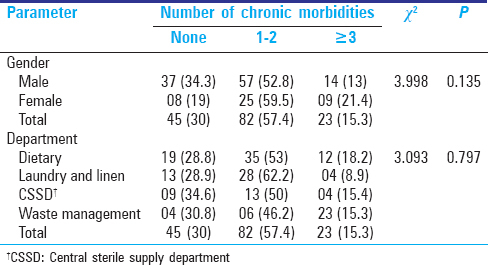 45 (30%) had no chronic morbidity, 82 (57.4%) had one to two morbidities, and 23 (15.3%) had three or more morbidities. There was no statistically significant association between gender or department and the number or morbidities present in a worker [Table 3]. The AMC helped detect and diagnose the following in apparently healthy workers: Diabetes mellitus (7, 4.6%), hypertension (4, 2.7%), severe anemia (5, 3.4%), and varicose veins (3, 2%). Abnormal Papanicolaou (PAP) smear was reported in one employee who was referred to the gynecological-oncology department for further management. Among the known cases, five hypertensives and four diabetics were not under control and were further evaluated and managed accordingly. After evaluation and screening at the staff clinic, employees were also referred to other departments such as ophthalmology, orthopedics, endocrinology, dental, dermatology, chest medicine, obstetrics and gynecology (OBG), general medicine, gastroenterology, cardiology, and ear, nose, and throat (ENT). There was a significant positive correlation between the age of the employee and the number of chronic morbidities they suffered from, as with the increase of age the number of morbidities also increase. There is no significant correlation between the years of work and the number of morbidities [Table 4]. A major proportion of the employees examined was male (72%). The most common chronic morbidity among this population was diabetes mellitus (11%) followed by hypertension (10.6%). Lifestyle disorders were seen to be the most common, may be due to the sedentary nature of the work done in the ancillary departments and the mean age of this population being well above 30 years. The third most common morbidity was musculoskeletal pain (MSP) (9.3%), which comprised bodyache, hand pain, leg pain, low backache, and neck pain. The workers in ancillary departments spend 7-8 h a day either standing or sitting in awkward postures, doing repetitive work, carrying heavy weights, which may largely contribute to the various aches and pains. Prevalence of MSP was seen to be much lower in this study (9.3%) compared to that by Yasobant et al. (50.7%) among health care professionals. One in every 10 workers at the dietary department was diagnosed to have a worm infestation. This is an important morbidity, which needs to be investigated as these individuals come in direct contact with food that is supplied to a large number of people admitted in the hospital. Those who were detected to have worm infestation were treated for the same and advised not to handle food until their repeat stool sample was negative. Three workers from the central sterilization and supply department reported occupational injuries such as a cut in the hand while sorting instruments, ankle sprain, and injury to arm while transporting materials. Instructions regarding occupational health and safety measures should be reinforced among all the staff working in ancillary departments. Surgical problems such as hemorrhoids and varicose veins were seen among the workers. Prolonged standing posture during work can cause or exacerbate this surgical condition. Workers should be taught about ergonomics and should also be encouraged to take short breaks during work. Those employees whose work involves standing for a long duration of time can be provided antifatigue mats. The AMC thus enabled us to screen for chronic morbidities, diagnose, and initiate early treatment. Cross-references to other departments were done for conditions such as impaired vision, surgical problems, thyroid abnormalities, and dental caries. Lifestyle disorders such as diabetes mellitus and hypertension were the major morbidities among the staff in the ancillary departments of the hospital. We ensured regular follow-up, adherence to medication, and lifestyle modifications in terms of diet and exercise. Periodic deworming and repeat stool examination were performed for dietary workers. The authors would like to thank all the physicians posted at the staff clinic for supporting this cause. ′What are hospital ancillary services?′ Available from: http://www.ask.com/business-finance/hospital-ancillary-services-9d29f56fe8e18d53. [Last accessed on 2015 Mar 4]. Ancillary Services (Health Care) Law and Legal Definition. Available from: http://www.definitions.uslegal.com/a/ancillary-services-health-care/. [Last accessed on 2015 Mar 4]. Occupational Health Services and Practice. Available from: http://www.ilo.org/safework/lang--it/index.htm. [Last accessed on 2015 Mar 04]. Farlex. The Free Medical Dictionary. Available from: http://www.medical-dictionary.thefreedictionary.com/yearly + checkup. [Last accessed on 2015 Mar 4]. Yasobant S, Rajkumar P. Work-related musculoskeletal disorders among health care professionals: A cross-sectional assessment of risk factors in a tertiary hospital, India. Indian J Occup Environ Med 2014;18:75-81.